I started playing because frankly, I’m an action junkie, and this game serves up a volatile course of action. My prediction is that this game will become very popular, and it’s still a good idea to get a large number of hands under your belt, because what I say might not make sense or sound like good advice, and to be honest, I’m not that great and many will surpass me anyway; some certainly already have. Frankly, I’m an action junkie, and this game serves up a volatile course of action. So, where to start? When I first sat, I took the standard approach one should take in any game, which is, to tighten up and play position. With a few adaptations, one can walk away a winner every time with this method, and can do so very quietly. It’s another good idea to not play short-handed in the beginning, as the ranges of hands, especially on the river, can be frustratingly close, with a lot of 1st to 2nd or 3rd nut hands. As you’re playing tight in the beginning, you must take notice of the betting patterns of the other players. This is key, because you’ll be able to recognize patterns; usually in discerning protective bets from draw bets, from most players. Take special notice to the speed and size of the bet from your opponent, especially on the turn and river. Almost always, pot-bets mean your opponents are holding the nuts and protecting, and three-quarter bets are draw bets. 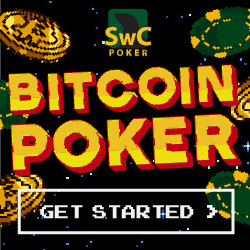 SWC’s software enables players to easily bet half, three-quarter, and full pot, so also mark the speed at which players do this. Higher levelers will reverse these, possibly, but still, tendencies, especially when multi-tabling, tend to reveal themselves. Only the best mask this well. This is important as you move up in levels, because as you move up, the amount of bluffing increases. While you’re profiling your opponent, you’ll begin to note different general strategies, the two main ones I denote the “Bombs Away” and the “Tactical Warfare” approaches. The “Bombs Away” approach is to bet everything, and the upside for this is that it wins a lot of pots short-handed. The downside to this is that it forces the bettor to essentially wave a white flag when they check, and furthermore, if they don’t, they are exposed to the check-raise, and that can be extremely tilting. This strategy necessitates a large bankroll, and one simply cannot be afraid to lose some pots to play this style. It is too dangerous for my likes. The second, “Tactical Warfare,” has two sub-genres. First, one I don’t employ, is the short-stack. Pots grow quickly in this game, and by post-flop action, it’s easy for z short-stacker to be all in. And so, since it’s a slightly limited amount, the short-stack shoves all until they double or triple up, then transitions into a more traditional game. Psychologically, it works, because either the opponents will be less likely to call an all-in, or, more likely to widen the suspected, and overcall with weak draws or weak two-pairs. The player mitigates the risk by bombing away while masking his hand and not endangering a big stack. Since I don’t employ this, I amusedly call this the “Afraid to Play” method. By and large, I try to see a lot of cheap flops, and play my opponents correspondingly. My method, the “Coalition Forces” method, is a nice mix. By and large, I try to see a lot of cheap flops, and play my opponents correspondingly. In most cases, depending on the number of players, I will float all flops, if the price isn’t too high. Too many things can happen with all the card combinations from flop to turn, and essentially, there are 0 stone-cold nut hands on the flop. It is impossible. The turn is where most players tend to reveal themselves…one usually makes a commitment or surrenders. My preference is to call the flop and turn bets, and never raise. This is to blunt the pot-size and mask my made hands from my draw hands. I rarely re-raise the flop and turn, because the river check-raise is much more powerful: it appears stronger if you’re bluffing and nets more callers that feel pot-committed when behind. I’ve sprinkled some morsels for you in this article, but ultimately, this game, as you play it more and more, tends to unfold in sequences of good and bad runs. Controlling your tilt and the transcendent quality to have in this game. You will sustain heavy chip casualties – it is guaranteed, and a big loss is a rite of passage. Do not let it get to you, and quit the session if you must. Don’t feel bad about leaving, and if you feel bad, don’t try to “win it back,” or “lose it all.” Those are both gambler’s fallacies. And I feast on this tilting. And trust me, some have feasted on me. Best of luck at the tables! Make this game a popular one! Nice article! Do you play big O/8 as well? That’s my favorite game at the moment. I mostly play it live, but I’ll jump in if I see it running on SwC too. Ha! You realize how bad I am? I only played a few times, and I felt like I was better suited for NL Big PLO/8 on the old site. I just assumed it was too much for my pea-brain to handle, and I didn’t want to start playing and trying to catch both games at once, because I’ve gotten confused about which game I was playing, even if I was mixing up Big O and NL Single Draw 2-7! Even in the month since I wrote this, the game evolved and/or I ran so bad that I started losing/tilting myself. I certainly haven’t evolved in the correct direction. So, I’m just thinking about the game in spare time. I’ll come back, and I’ll write more later. I’m trying to catch the game’s very broad trends and its own evolution, and “reporting” in real time. I feel like we’re in the early stages of the development of the next big game…at least online. I know it’s been played live around the world for number of years…but to answer the question, I may start to jump in as well. I hope to see you at some Big O/8 tables soon! It’s a great game. The next big game might be Six Plus Hold Em. It’s an action game, and I’m really hoping that SwC will spread it sooner than later.